Wedding catering can comprise a range of styles and options. Traditional sit-down catered weddings, whilst ever popular, are giving way to more creative, community-focused style events. Below are a list of some wedding catering styles, but you can be creative, you can mix and match to keep it the style of your wedding catering interesting. This traditional wedding may begin with canapés on arrival (usually 3 -4 per person), followed by a three course dinner (for example); entrée, main and dessert. Occasionally a course may be omitted due to budgetary constraints or individual tastes. Speeches, if done will often occur between entrée and main, main and dessert or in between all. Dancing and the cutting of the cake may be after main but before dessert. An ever increasingly popular style for wedding catering, the stand-up event (once frowned upon for the meagre amounts of food) can be designed to satisfy the biggest appetite with a range of substantial items and bowl food options that substitute adequately the sit down event. A sense of community exists with mingling and networking amongst guests. A creative flair can manifest with a range of items all designed with individual presentations. Wait staff continually and in almost-choreographed precision, move around the venue ensuring everyone is served. Also a traditional style, the catered wedding buffet allows guests to enjoy a range of culinary delights. Presented beautifully with colour and height, the buffet comprises the full complement of dishes from cold to hot. Guests can enjoy seconds or, like the Danes take smaller portions and return regularly. Usually a chef or chefs and wait staff serve guests, which make the experience even more pleasing. 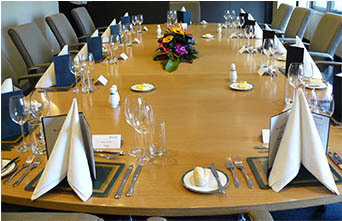 A relatively new comer to the wedding catering market, a shared style event has many benefits; the relaxation of the sit-down with the community aspect of the buffet and cocktail. The passing around of the food on the table creates conversation often lacking at a sit down event, and the camaraderie that ensues often leads to a more enjoyable event. Similar to the buffet, guests enjoy a range of food options and can eat to their tastes rather than being placed with a plate of required eating.